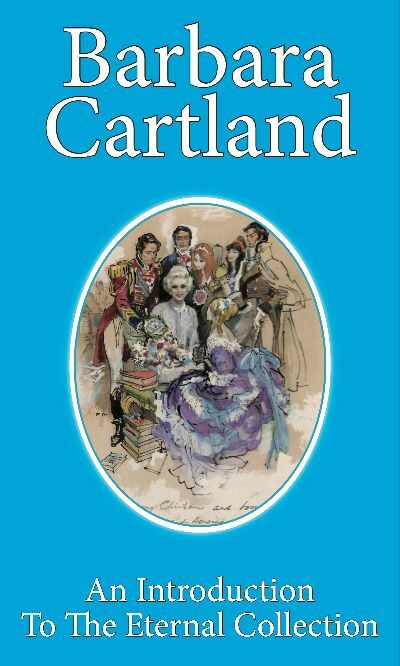 The Barbara Cartland Eternal Collection is the unique opportunity to collect as ebooks all five hundred timeless, beautiful romantic novels written by the world’s most loved and enduring romantic author. This specially priced volume of four titles is both a celebration of the Jubilee and your introduction to the Eternal Collection which will be published four titles per month until all five hundred are available. 01 Elizabethan Lover Having sailed with Sir Francis Drake, swashbuckling privateer Rodney Hawkhurst yearns for a galleon of his own with which to plunder the Spanish Main in the name of Queen Elizabeth. Seeking investment from Sir Harry Gillingham, he has a fleeting encounter with an elfin, tomboyish golden-red-haired beauty Sir Harry’s youngest daughter Lizbeth and is bewitched by her limpid green eyes. Yet it is fair and golden-haired elder sister Phillida with whom he first falls in love… Granted his finances on the condition that Sir Harry’s weak, possibly even traitorous son sails with him in the hope that the mission will make him a man, Rodney embarks on a voyage of blood, honour and glory in which he gains great riches but loses his heart, not once, but twice. The risks are great but so are the rewards: wealth beyond compare and, as Rodney finally discovers, a greater, deeper, more passionate love than he ever imagined possible. 02 The Little Pretender In 1750 Scotland, just four years after Bonnie Prince Charlie’s Rising of the Clans, it’s hard to know who’s loyal to the English and who is faithful to the Stuarts. And it’s beautiful seventeen-year-old Iona’s perilous mission to ascertain whether the Duke of Arkrae, head of Scotland’s most powerful clan, is a traitor or is he in cahoots with the English. The plan is for Iona to gain the trust of the Duke and his clan by claiming to be the sister he thought to have died as a child. As all around her doubt her claim and call her a pretender’, Iona struggles to hold her nerve. Her native wit and steel nerves do not fail her but almost instantly, on meeting the imperious Duke, it’s her heart that lets her down. She’s fallen deeply, hopelessly in love! Traitor or not, surely the Duke could never love the Little Pretender who was sent only to ensnare him? 03 A Ghost in Monte Carlo Eighteen-year-old Mistral is an innocent abroad in the sophisticated Côte D’Azur, where princes and millionaires mingle in the casinos and sumptuous hotels while others plot to relieve them of their riches. Accompanied only by her embittered and domineering Aunt Emilie and kindly servant Jeanne, Mistral appears dressed all in grey like a ghost in the salons and ballrooms of Monte Carlo and sets Society’s tongues wagging. It’s not long before her waif-like beauty has men falling at the feet of Mademoiselle Fântóme gentlemen such as Sir Robert Stanford. But on her sister’s bewildering but strict instructions, she must not converse with any but the Russian Prince Nikolai, who’s also keen to woo her, as is an opulent Indian Rajah. Something about Mistral touches Sir Robert’s heart and he cannot understand why Mistral appears afraid to be with him. Yet both of them crave love. Only if Mistral’s innocent eyes are finally opened to the truth that Aunt Emilie’s motives are borne not of concern for her niece but of pure evil and greed will she find her heart’s desire. 04 A Duel of Hearts Just seventeen, Lady Caroline Faye is already the toast of the Season and accustomed to the ways of genteel Society. So when notorious cad Sir Montagu Reversby offers to drive her in his phaeton from London to Sevenoaks, she innocently accepts little knowing that he is planning to fake a broken axle so that she will be forced to spend the night alone with him at a remote country inn.